During sunrise and sunset, a good opportunity arises to observe different aspects of clouds. During these periods, changes in the contrast and colour are observed as well as structure of the clouds. Such sunrises and sunsets can develop into some of the most spectacular events that exist in meteorology. Obviously, sunrise and sunset are mostly noted for the associated changes in the colour of the sky especially around the sun. 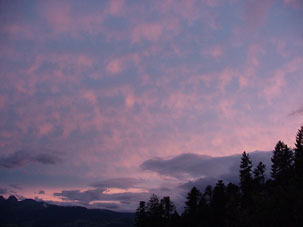 On some occasions, clouds will also reveal different colour patterns if present around sunrise and sunset. It is very difficult to describe the various colour changes that occur with the different clouds around these times. But there are general stages that are associated with the times from dawn to sunrise and sunset to dusk. The heights of the clouds have an important influence on the length of times that cloud reflections occur. The higher the cloud, the longer the cloud bases will be able to reflect light. In fact, high clouds will reflect light for periods of up to 30 minutes whilst low clouds will typically reflect light from their bases for around 5 to 10 minutes. The reason for such a vast difference is that lower level clouds near the horizon are much closer to the observer ( around 1 to 15 kilometres away) than clouds at higher levels which may be up to a few hundred kilometres away. The cloud bases of higher clouds therefore reflect light well before sunrise and remain so until just before sunrise. The same situation still applies for sunset but in the opposite order. The process of sunrise and sunset obviously occurs in a set pattern. Let us consider only one level of cloud in the sky. The cloud closest to the horizon will reflect light first. Gradually, clouds further away will also begin reflecting light. The process continues with colours changing from red and pink to yellow although occasionally some blue or violets are also observed. This of course depends on the heights of the cloud and the patterns of their bases. Now, if combinations of clouds occur, then different patterns will be observed representing the different reflections of light from different levels of clouds in the atmosphere. This means that the higher clouds are still reflecting light from the sunrise for instance and lower level clouds are only observed as darker regions with no light being reflected from their bases. In the case of the lower clouds in particular, their shadows are observed as well as the sun's rays. This provides the observer with the opportunity to observe the outline structure of the clouds, especially cumuliform clouds with rounded tops such as cumulus. 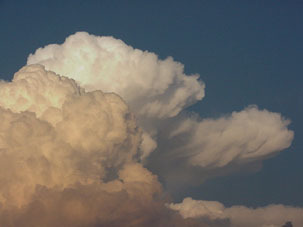 During sunrise and sunset, even the same types of cloud may appear different in various regions of the sky. Cumulus, for example, will reflect more light at the opposite regions of the sky to that of the sun as compared to cloud closest to the sun. This creates a varied contrast and must be taken into account by observers trying to determine the different types of clouds in the sky.